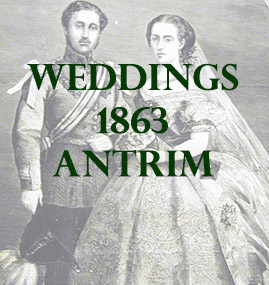 The following list contains marriages that mention places in county Antrim. At Antrim, Thomas son of James Hunter Esq., Killealy, to Annie, daughter of Thomas Bryson Esq., Rockhill, Ballyrobbin, County Antrim. At Belfast, W.P. O’Connor Esq., to Hannah Stewart, daughter of the late Rev. Alexander Stewart Elsmere. At Carnmoney, county Antrim Owen R. Slacke Esq., 10th Royal Hussars, son of the Rev William R. Slacke, Newcastle County Down, to Katherine, daughter of Charles Lanyon, Esq., Whieabbey, county Antrim. At Belfast, Philip Fletcher, son of Jonathan Richardson, Esq., Lamberg House, county Antrim, to Jane Elizabeth, daughter of Andrew Cowan, Esq., Queen’s Elma, Belfast.